Bricks & Wood- School Art Activities: Totem Poles! We just completed one of my favourite art projects of the year. Our current topic is Road Trip USA, which has a particular focus on Native Americans. As the children had enjoyed their totem spoons so much, we decided to go down the totem pole path. During my quest on Pinterest for some totem pole art inspiration, I came across a huge range of amazing ideas. My attention was caught by these 3D totem poles by Ms. Gram and I originally planned to model my lesson around hers. The totem pole presentation that Ms.Gram had put together was very useful and served as a great hook. Unfortunately, some of the thicker posterboard was quite difficult to obtain so I went with a similar lesson to this brilliant idea from Thomas Elementary Art. Not only were the results outstanding, but I thought as a class we could use some extra collage practice so this was ideal. We learnt about what totem poles were and where they originated. This led to a really interesting discussion about animal symbolism and what sort of animal we would compare ourselves to. 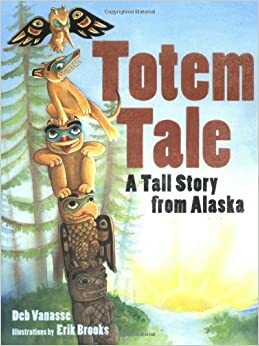 Furthermore, we read "Totem Tale" by Deb Vanasse to improve our understanding. The aim of this project was to select an animal with symbolism that the children felt matched their own personality. They would then need to create a stylised version of this animal using only cut up coloured paper. Once completed, these could be attached one on top of the other to produce a class totem pole. After looking at the presentation by Ms Gram, we spent the first lesson sketching ideas into our book of stylised animals. It was tricky for the children to only use the page as their animal's entire face/body and resist the urge to draw an outline. This required lots of practice and reinforcement about what stylised means and how this effect can be created. The children were set homework to choose their animal and produce a coloured sketch of their finished product. The next lesson, children had an hour to turn these sketches into their finished, collage totem pole pieces. I was very impressed with their efficiency! 2. I showed the class how to cut their paper. The first instruction was to fold their paper (not the base paper) in half. We learnt about how to get symmetrical shapes by drawing half of the shape along the fold and cutting it out. We also learnt that if you want two identical shapes you should cut them out away from the fold. They really listened to this carefully! 3. Build up your totem piece. Really focus on layer on layer to create that stylised effect, using the colours well. 4. Add any final additions (like ears!) and you're done. This was definitely my favourite art project since I joined my school September 2013. I'm so pleased that all students could succeed and be proud of their work, even those who would insist that they 'can't do art!' I'm very excited for our next project which will be based on Native American headdresses. Once again, super job 4B! Dan- Thanks for your comment on my blog! I'm glad that you were able to use my plan and that your students wound up with super work. Cheers!